Find a plumber online and learn how to do it yourself. don't call a plumber do it yourself! Swann is regularly called up by Yell and Thomson asking to buy advertising with them, our budget is limited so we stick to a free listing and putting more effort into being more visible on google. Anyway I am quite glad we have not invested in a premium listing as when checking out their site today I noticed a video guide in their right hand column. Thats right pay yell to list your company but don't expect any calls as they are telling people how to do the work themselves! I checked a few different trades and their are a few that show links to articles on how to do things but so far it is only plumbing that shows a video. It's not a big deal all these things can be seen if you search on you tube but as a business plan yell are doing a great job at alienating their advertisers. 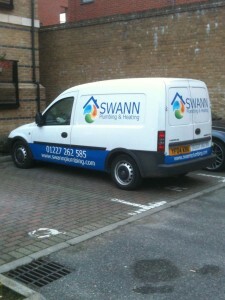 Simon is no longer a 'white van man' he is a white van with logo, title, phone number and web address man. Thanks to the very talented people at stiki media we have finally had our van sign written and it looks beautiful. Resting after a long drive to Bow to install a wetroom.